SamKnows One is extensively used in ISP NOCs to monitor end-to-end performance and reliability of their services. Receive alerts when your network performance drops below configured thresholds. Using alerting means you can setup checks for the metrics you care about and be notified when things change or slip below thresholds. This allows you to have peace of mind that SamKnows is monitoring your network for you without a constant need to be refreshing charts just to know if there’s been any change and when there’s a change, you can make sure you know about it first and resolve the issue before your customers start to notice. You can set to be alerts on aggregated data, where for example a percentile or average or agent count drops or falls; or on raw data, where you would like to know if any test results below or above a particular limit occur. 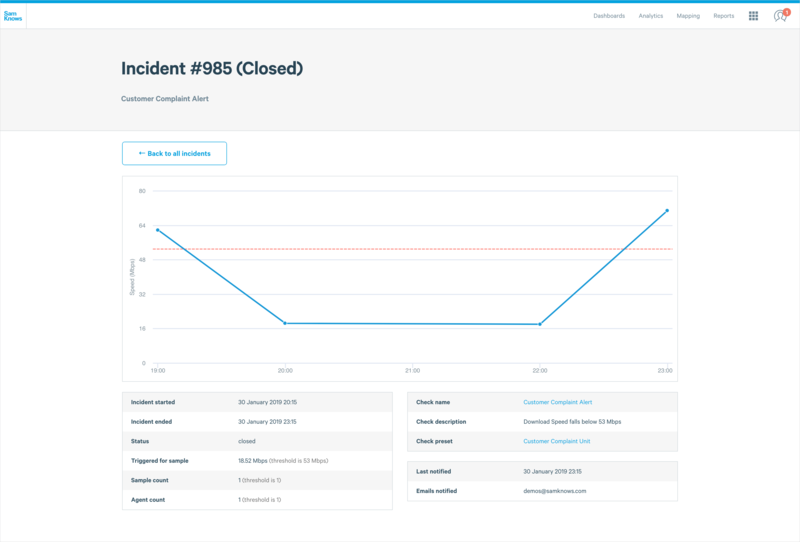 We allow you to manage incidents from within SamKnows One, providing an interface to see a graph of the incident and functionality to acknowledge, dismiss or silence incidents once you've been alerted. Once an incident has been resolved, we can send a notification and mark it as resolved where it can still be viewed historically. Like presets, alerts can be shared within an organisation or kept private to just the user who created it. Configurable alert re-notification periods - You can specify that after an alert you do not wish to be re-notified for a new incident on the same check for a certain period. Also called a 're-arming' period.